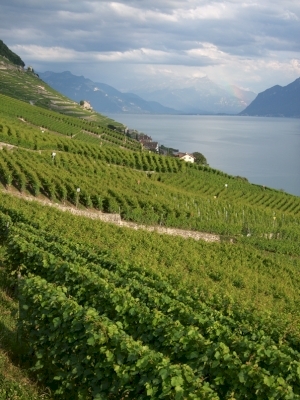 The Lavaux Vineyard Terraces comprise a 30km stretch of land along Lake Geneva where viticulture has been practised since at least the 11th century. There are even findings that suggest that already the Romans grew vines here. Local Benedictine and Cistercian Monasteries, who owned the land, started large scale winemaking here. They employed farmers to do the work, against a percentage of the earnings. The landscape is dotted with small villages and castles. The vines are grown on terraces: the location benefits of a temperate climate due to the reflection of the sun in the lake and the stone walls. Wines that are produced here are not well-known around the world. They include The Villette, Saint-Saphorin/Lavaux, Epesses, Dézaley and Chardonne. We have now 24 WHS connected to vineyards. 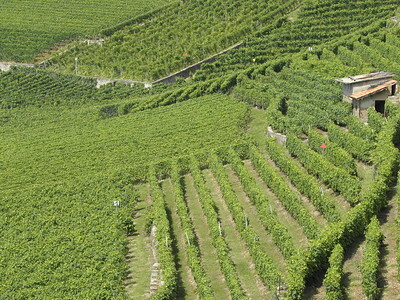 In some cases it's just a small part of the site, in at least 5 others like Lavaux the OUV is all about vineyards. That there are so many of them seems to be the result of the recent 'love' for the cultural landscape concept, the ways in which man interacts with and transforms the natural landscape. And somehow promoting viticulture is more attractive than the produce of grains for example. Though wines are produced all over the world, all 24 vineyard WHS are located in Europe! No wonder ICOMOS had a hard time looking for the uniqueness of Lavaux. Its main characteristics are its terraces, and the density of them. But it is by no means the only or the first site where vines are grown this way. It does not produce famous wines either. They might just have been blown away by the excellent nomination file made by Switzerland - like the one for La Chaux-de-Fonds/Le Locle it is very well-presented and extremely detailed. I visited the area on a Sunday morning. The easiest way to see it is from the local train between Lausanne and Vevey. Do not take the intercity train, as this one just speeds by. From the local train that runs once an hour you can descend at the little towns along the route. I stopped at Saint Saphorin, and walked to Rivaz from there on a very fine hiking path about midway through the terraces. There are great views from here on the green vines, the glittering lake, a castle and some shapes of the Alps. Signboards along the way display background information about how the vineyards are kept up. I really enjoyed this walk, especially while it was sunny and much warmer than at home. I finished with an excellent lunch at the Auberge de Rivaz. I visited the site by train from Lausanne as late afternoon-evening trip, and I was only person walking through the wineyards, it was in July 2012. I enjoyed my walk and beatiful views as well, although I still do not fully understand OUV of all those cultural landscapes related to cultivation of wine. Anyway, the place is special and worth-visiting if one is in the area of Lac Leman. On a glorious sunny Sunday I went hiking from Saint Saphorin to Epesses. I had stayed overnight in Lausanne from where I took an early morning train to Saint Saphorin. 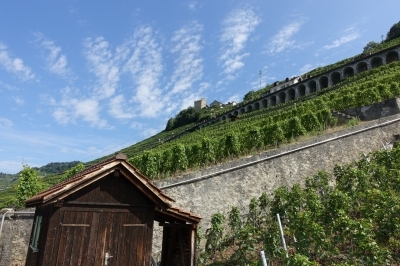 The Swiss in usual fashion have a proper heritage trail set up running right through the vineyards. The views of Lake Geneva and the vineyards are fine, especially with the Alps as backdrop. But that's about it. I am hard pressed to name a single component of the site deserving special mention. Maybe the old town of Saint Saphorin. Still, I had a pleasant time hiking. The local railway line from Lausanne to Vevey cuts right through the vineyards. From Lausanne you can connect to all parts of Switzerland (Geneva, Zürich Hotspot). Geneva also connects you to France and has an international airport. Lausanne where I stayed overnight is a nice city and I would assume this also holds true for more cities along the lake such as Geneva or Montreux. Lausanne is the center of the Jura Swiss Alps Hotspot. Nearby on Lake Geneva you will find some Le Corbusier houses and some of those fabolous pile dwellings. Bern isn't far either. I meanwhile continued to La Chaux-de-Fonds. I really liked Lavaux, visiting on a beautiful day in June 2015. Setting off from our base in Lausanne we caught the train to Lutry and walked the 11km tourist board-recommended route to St Saphorin. This allows you to take in the whole length of the inscribed area as you weave through the vineyards beside Lake Geneva. They also suggest suggest 'caves' along the way in which to try the wine. The locals have a saying that there are three suns warming the vines in Lavaux: 1) the Sun in the sky during the day; 2) its reflection from the lake and; 3) the heat that is stored up in the dry stone walls by day and radiated out to the vines at night. My only complaint is that it is impossible to try any of the wine until evening time because nothing opens until 5pm. There are no shops in most of the villages you pass through either, so bring a bottle of water! I visited this WHS by car in July 2013. What a pleasant drive indeed. I parked near Rivaz after reading Els' review and walked to Saint Saphorin. The views of the vineyard landscape, the Alps and Lake Geneva are fantastic especially on a clear sunny day. This site is best visited by train, as the railway runs through the site along the shore of Lake Geneva from Lutry to Vevey. It is a simple matter to get off at one of the small stations and walk through the vinyards to the next. At Lutry and Cully there are small trains that make tours through the vinyards and hamlets. I was amazed at the amount of retaining work had been built to support the terraces, in the form of concrete walls, buttresses and rock anchors. As a child, I spent a great deal of time in this area and it is one of my happiest memories. The combination of small historic villages, century-old vineyards,sloping hillsides, gorgeous views of Lake Geneva (Lac Leman) and of course incredible views of the Swiss and French Alps. Side trips to the enchanting Chateau de Chillon, The cheesemaking town of Gruyere, the college town of Lausanne, the international hub of Geneva and the ski resorts of Vaud and Valais are jsut a short trina ride away. This world hertiage site combines, architecture, culture, natural splendor, history, commerce and relaxation.